Hi and welcome to our magnificent showroom of amazing limousines. Hand selected to take you wherever it is that your heart desire to go within the Perth metropolitan area. One thing that set us apart from the competition is our modern state of the art fully pimped out limousines. From the elegant looking white Chrysler (popular for weddings and corporate events) to the sophisticated laser tech Hummers. Not those boring old looking limousines that you see around. Pfftt! We're talking about stretched Hummers with amazing superloud bass pumping subs and premium speakers. It is by far the most loudest "night club on wheels" going around in Perth. So what makes up our fleet here at Perth Limos? Well feast your eyes on this baby! 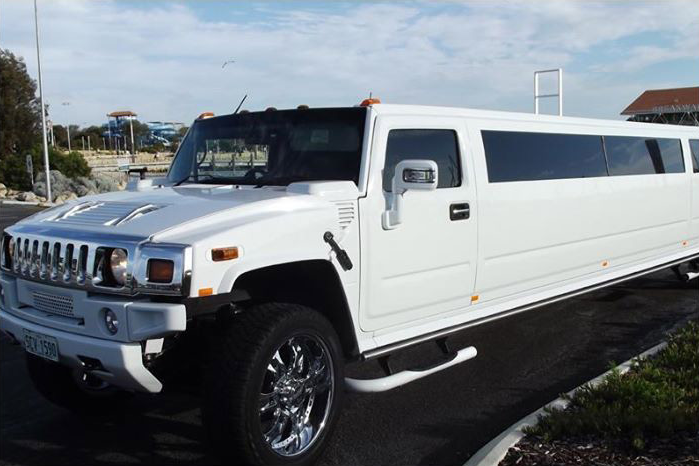 We have not one, but FIVE H2 Hummer super stretch limos. 14-16 seat capacity, take the whole mob! Top of the range sound system consisting of alpine head deck, 6 massive bassy subwoofers, and 6 independent amps to power the beast up! 3 air-conditioning units to really cool down the inside as things can get heated up, if you know what I mean! Also includes lots of bling! Come and see it for yourself. You'd be forgiven thinking it's Mr T's accessories! Our beautiful pristine crystal clear white Chrysler Limo is especially made for your blissful wedding! Let our luxurious and elegant looking white beast fulfill your wedding dreams! Similar to the Hummers, our Dodge Nitro Super Stretch Limo is fully blinged out dude! The only visual difference is that it sits lower to the ground when its sitting side by side with the Hummer. You get all of the features found with the Hummer, including an awesome spectacular lightshow. The lightshow is insanely crazy, it has over 1000 settings to choose from! Dim the light for a romantic interlude or light up the whole city to be seen! Same as the others, the sedan version is a standoud making others looking envious. The seating capacity is reduced to only four - for people wanting a more intimate seating arrangement.